My littles love gingerbread -almost to a fault. On more than one occasion I have caught one of them nibbling on the annual gingerbread houses we make and decorate at Christmastime. Lots of times, the houses are created from my mother-in-laws yummy homemade gingerbread, but other rushed years, we have relied on the store bought kit-in-a-box. That's where the 'almost to a fault' incidents come into play -nibbling on the gross, cement like ginger grossness. So that's why I was so happy to discover these chocolate gingerbread bars. The littles can nibble on these gingerbread bars, sparing the store-bought manufactured house variety. Preheat the oven to 350 degrees. Butter an 8 in square baking pan. Line bottom with a parchment paper, letting it overhang on both sides (for easy for removal after the bars are baked. Butter the paper. Dust both the paper and the sides of the pan with cocoa powder; set pan aside. In a medium bowl, whisk together cocoa, flour, ginger, pumpkin-pie spice, baking soda, and salt; set bowl aside. In a large bowl, whisk together butter, brown sugar, molasses, egg, and sour cream until smooth. Add the flour mixture and stir until just mixed. Stir in the chocolate chips. Spoon the batter into prepared pan, and smooth the top. Bake for 30-35 minutes, until a toothpick comes out clean. Transfer to a wire rack to cool. 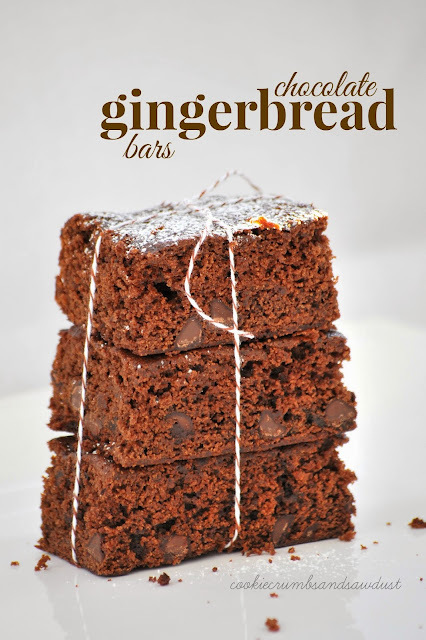 Pull gingerbread from pan using paper overhang, and cut into squares. Dust with powered sugar before serving. Let me know if you give them and try and they are worthy of your holiday repertoire.